This cake was made for my daughter's 2nd birthday in April. I made two 8 inch sponge cakes. One was vanilla and one was strawberry. I flavored the strawberry sponge cake with lorann oils. I made a banana creme butter cream icing and again flavored it with the lorann oils. 8 ounces of self raising flour, caster sugar and butter. Also, a little lorann oil for your own taste. 250 grams of butter and 500 grams of icing sugar with a little banana creme lorann oil. I filled the cake and crumb coated it with the butter cream icing. 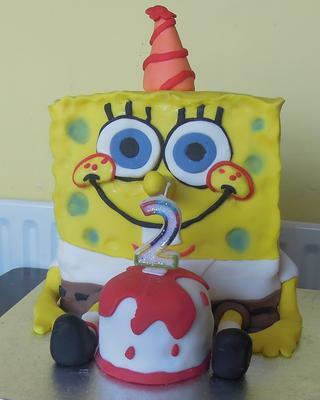 Then I covered it with fondant and all of the fondant details to make it look like Spongebob. I also made a small vanilla cake for Spongebob's birthday cake that he is holding and that held the birthday candle. I love SpongeBob, this looks so good. You did a very god job.